We’ve had a couple of hot windy days. Days where the mornings start out windy and warm, and then it picks up and gets hotter during the day. I recognize them. They’re fire days. Our friend Chel came out of the woods the other day, and said she loves the energy the wind brings. I say good for her. For me it’s slightly unsettling . It howls and makes me look at the trees and wonder which ones are going to fall. I worry about paddlers and towboats, and……….it's fire weather. Many happy guests blow in with a tail wind. Memories are being made. We swim every day. I’m currently on my deck because it’s such a beautiful night, such a gorgeous time of year. A gentle wind but even this late it still blows.... When we send people out with permits, we say there are no current fire restrictions imposed by the Forest Service. There aren’t. But then I add……on the hot windy afternoons, about 3pm…….feel free to impose your own fire restrictions on yourself. Can’t you feel it? 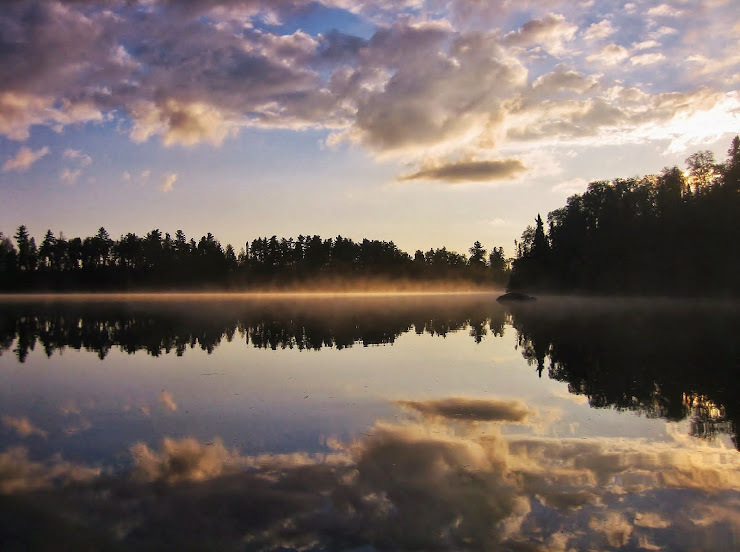 Some people call them the dog days of summer, but I know....they're fire days..
Last night I was driving the kids home…on the Gunflint Trail by Loon Lake, there was a strong smell of smoke, and my eyes started watering and Shelby said……….ooo, strong déjà vu! We could see the smoke from a little fire south of the trail, the Lizard Lake Fire. It originated from a lightening strike, has been smoldering for 10 days or so, and finally started to feed on the wind. By some reports it's 15 acres, by other reports it is now 45. The USFS fire policy , as I understand it, is to let small natural fires like this one burn out. After all, this boreal forest needs fire to regenerate itself. 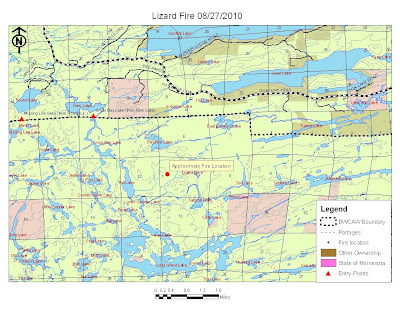 Ideally, it’ll happen one little Lizard Lake fire at a time. And, just because this one happens to be close enough to smell on my trip to town doesn't make it more threatening......... theoretically. These last two afternoons, while carefully monitoring the progress of the fire, the wind direction, the weather reports-- the Forest Service has had some huge orange water tanker airplanes….dropping water on the north border of the fire, as it creeps along, to keep it from the Gunflint Trail. These are such enormous planes, for a minute it seems like they’re in control.. But I know better, ...... when a fire wants to burn in this wind, it burns where ever it wants. This one has swamp all around it, and it's apparently a weak little Lizard, because it isn't going very far. This afternoon as the kids and I drove by, we couldn’t see much smoke. We could smell it, but our eyes didn’t sting. We’re due for some rain soon. The weather report says that we'll return to cool mornings in the near future . 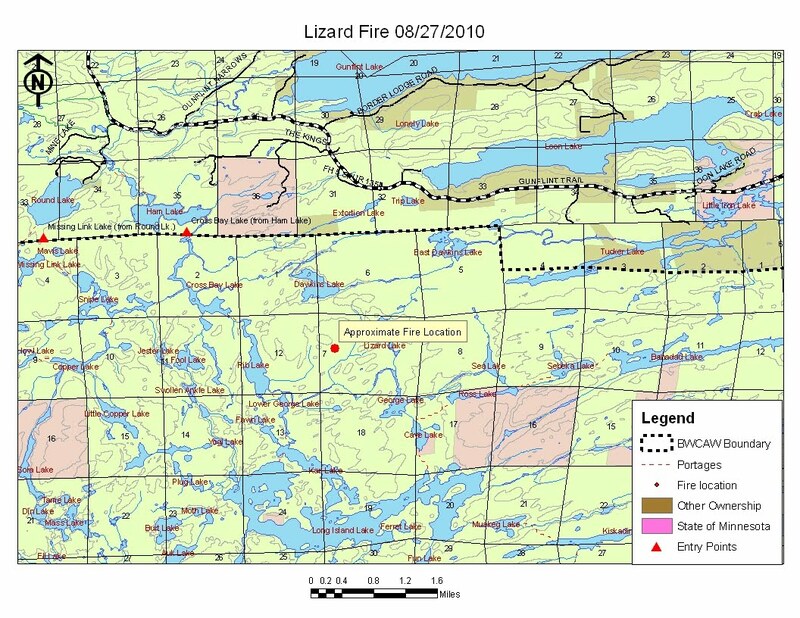 The Lizard Lake Fire probably won't even make much of a name for itself …a light to moderate fire…creating a seedbed for pines….exactly how it is supposed to be. The wind is dying down now, the energy is subsiding, calming. I’m confident the Lizard has gone to sleep for the night and so will I………. Note: it's Monday morning now.... we've had some rain....that poor little Lizard just took a hit.